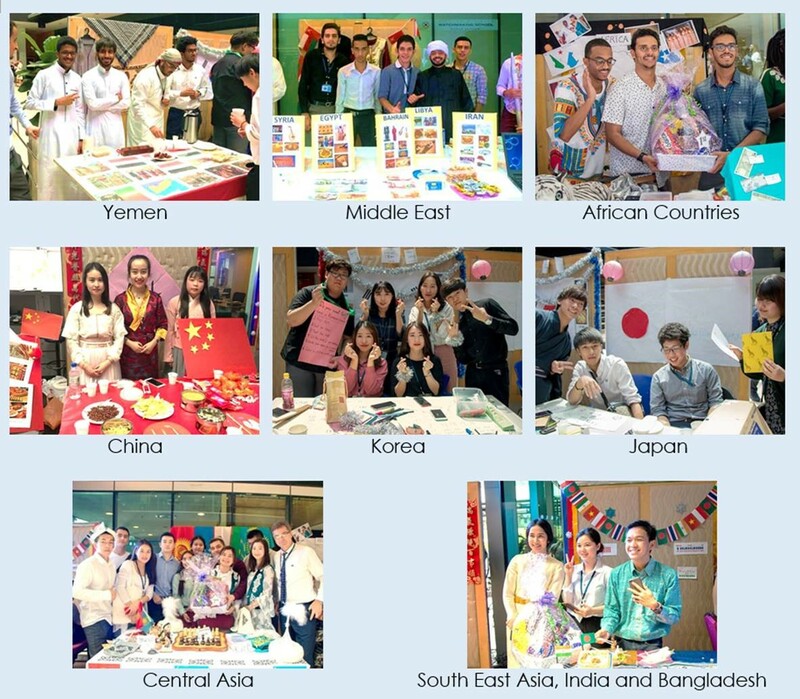 The Asia Pacific Language Centre (APLC) recently brought the world together, as they organized the APLC Cultural Day at APIIT & APLC Campus @ TPM recently. During this prosperous event, there were many exciting performances and booth displays. 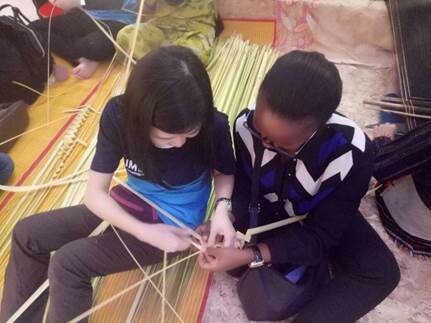 Students and teachers worked hand in hand to provide an interesting learning experience of cultures around the world for everyone at the event. Booth displays were arranged by the students who were enthusiastic to not only work together on how to best represent their cultures, but also to learn from others. Each booth provided a myriad of information, decorations, traditional attires, games and food from their respective countries. Students had the opportunity to learn about different cultures in a fun and competitive manner. There were a total of 8 competing booths out of 9 where the Malaysian booth was represented by the teachers. On the other hand, total of 10 amazing performances by the students not only showed the aesthetic beauty of their cultures, but also their profound talents and love for their nation. The performances included traditional and modern dancing, singing, playing a traditional musical instrument, calligraphy and fashion show from the Middle East, African countries, Kazakhstan, China, South East Asia, Bangladesh, India and Japan. Lastly, a demonstration of the Malay traditional martial art called the ‘Silat Seni Tari’ by our guest performers, the members of APU Malay Cultural Society (AMCS) wrapped up the colourful and culturally mesmerising event. It was definitely a fantastic experience and opportunity for students, teachers and attendees of the event to learn about the many cultures around the world. 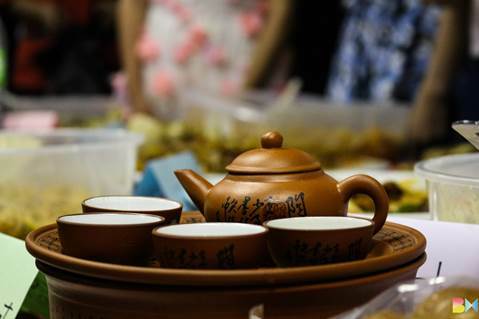 The success of this event was made possible through a common language, English, which united people from different parts of the world under one roof. It is with high hopes that this event will always be cherished as one of the many beautiful memories of the students of APLC. 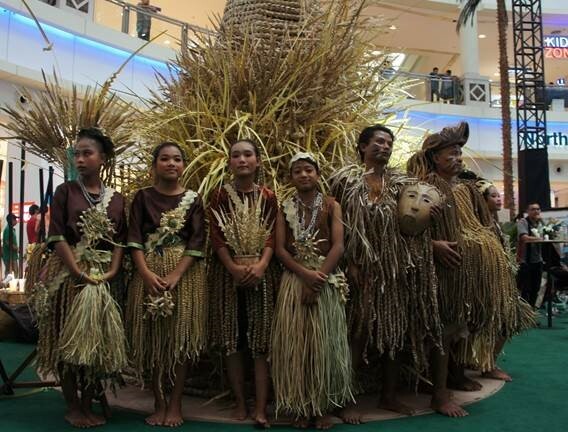 As part of their experiential learning process to learn and understand about the importance of cultural preservation, the Diploma and Degree students from School of Marketing and Media visited the 10th Anniversary Celebration of the CIMB Foundation, that showcased the Mah Meri aborigines from the Mah Meri Cultural Village, Pulau Carey. As part of the event, they also contributed to the effort of completing the 8,888 pieces of Nipah Leave origamis - Bunga moyang, displayed on a Mah Meri Busut. This has set a new record in the Malaysian Book of Records, for the most number of Nipah Leaves origamis produced within the event. Mah Mehri is a sub group of the Senoi people (aborigines) who live along the coast of Selangor. The Mah Meri are renowned for their masterful woodcarving and expressive masks worn during dance rituals to represent ancestral spirits. Being extremely skilled in woodcarvings, their carvings also gained recognition from the UNESCO. It was an eye opener for our students as they also had the opportunity to watch the traditional dance performed by the Mah Meri people. Kudos to the School of Marketing and Media (SOMM) for offering such an unforgettable experience to our students; such experiences enhance students’ practical knowledge, in which they gain better understanding of a subject matter via participation and observation. 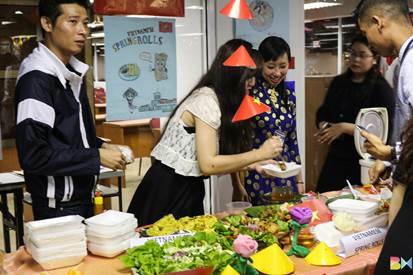 APLC hosted yet another colourful and flavourful event on 25th August, 2016. The event which is organised for the 8th year and is one of the biggest much awaited events is none other than the APLC International Food Festival! With participants from more than 20 countries, namely Malaysia, China, Japan, Korea, Vietnam, Indonesia, Thailand, Bahrain, Yemen, Saudi Arabia, Iraq, Iran, Kazakhstan, Uzbekistan, Bangladesh, India and countries representing the African continent; Libya, Djibouti, Egypt, Somalia, Sudan, Eritrea and Chad, the event was much bigger and better than previous years. Everything started going underway one month before the event with each APLC teacher taking charge of a few countries under the co-ordination of Ms. Sharen Kaur. Meetings were held each week to follow-up on progress and students were given responsibilities to decide on how they wanted to decorate the booth and what dishes to prepare to represent their country. Teachers guided their students on preparation of posters, costumes as well as some scripts on their food presentation. Everyone put in their best effort to ensure the success of this event. As hoped, the turn-out for the event was amazing. 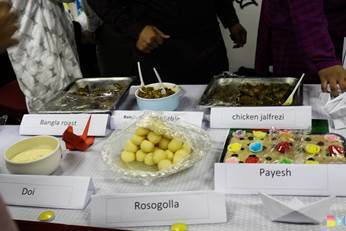 APLC and APU staff and students came together to enjoy the festival and find out about different dishes and cultures. Spirits were high with singing, dancing, chit-chatting and laughing that could be heard and seen all around while guests were savouring the delicious traditional dishes from each booth. 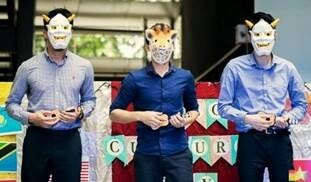 All in all, the event truly captured the essence of camaraderie and mutual respect amongst different cultures!